In the Hibassk® high-barrier film made by the Dutch company A. van den Broek BV (www.a-vdbroek.nl), a DuPont™ Surlyn® sealant layer helps to ensure that the red colour of vacuum skin packed meat will be preserved for a longer time and that the typical odour associated with conventional nylon-polyethylene film packaging is prevented from forming. At the same time, the storage life of fresh meat is thus extended. These benefits are the result of combining the gentle vacuum skin packaging technology with the excellent meat adhesion of Surlyn® which significantly reduces the undesired release of meat juice. With vacuum food packaging now a fast-growing trend in Europe, Hibassk® film pouches thus offer the meat processing industry an advantageous packaging alternative for superior product quality and retail shelf appeal. Moreover, the Surlyn® sealant layer represents a key step towards enhanced environmental sustainability and preservation of resources. Compared with commonly used PE sealant layers of similar efficiency, it helps to save raw materials and energy by supporting both thinner film structures and lower heat-sealing temperatures without compromising on sealing performance. 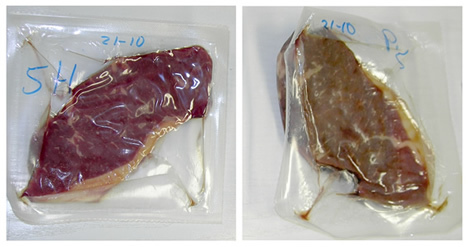 These simultaneously packed beef steaks clearly illustrate the effect: On vacuum packaged meat, the Hibassk® high-barrier skin film with DuPont™ Surlyn® sealant layer helps preserve the fresh red colour and fresh odour for a longer period (left) than conventional vacuum-sealing using PA-PE film (right). Indeed, the advantages of the Hibassk® high-barrier skin film are manifold. Generally, its low oxygen permeability of just 2 cm³/m²/day supports a long storage life of the packed meat. In addition, vacuum skin packaging typically involves less under-pressure and a shorter vacuum application cycle than conventional vacuum packaging. The meat pores are therefore not sealed off quite as tightly, so that some – albeit restricted – interaction with the environment can still take place. The excellent meat adhesion of Surlyn® is of special advantage here since only very little meat juice will be released, despite the meat’s more open pores. This effect is supplemented by the very good secondary sealing properties of Surlyn®, which make for a firm adhesion of film surfaces in contact with, but not directly heat-sealed onto each other. As a result, a perfect adhesion of the film to the meat product can prevent the release of meat juice on the long term, thus substantially diminishing this potential source of disagreeable odour. Further benefits of the Surlyn® sealant layer include its excellent sealing efficiency through contaminations such as grease and meat juice, its very high puncture resistance which is of particular importance when it comes to packaging meat with sharp bones, as well as its crystal-clear transparency which enhances the product’s retail shelf appeal. Contact us to plan an appointment!